Need to attract your target audience’s attention? The challenge: In today’s content saturated environment, media options and devices have shifted consumer media consumption behavior. So, how do you succeed? Willingness to pay for content and delivery options. Use the device and/or service they prefer. 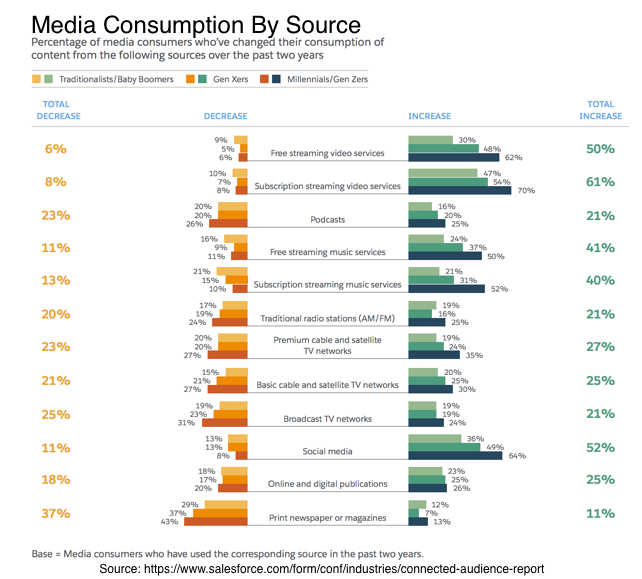 To best understand audience media consumption, a variety of research sources were used. Each research effort surveyed or tracked different sample groups. As a result, their results vary. Nielsen Total Audience Report uses the company’s proprietary data that only measures US adults over 18. This research provides consistent information over 4 quarters from 3Q2017 through 2Q2018. 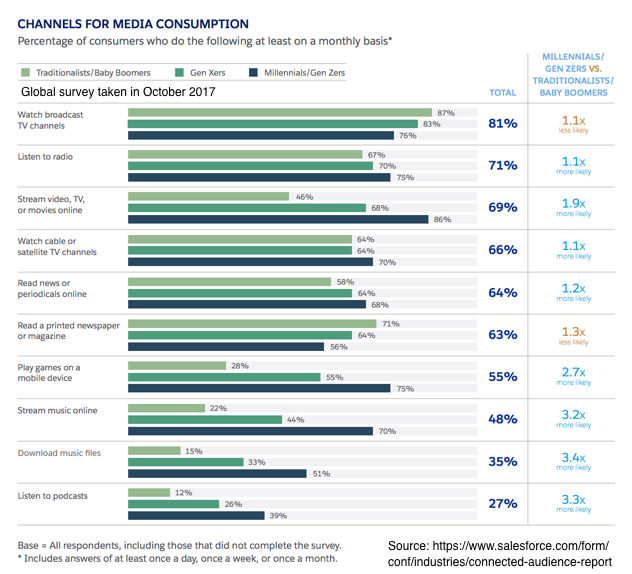 Salesforce fielded its Connected Audience Report in October 2017 to 3,080 global respondents and checked monthly usage. 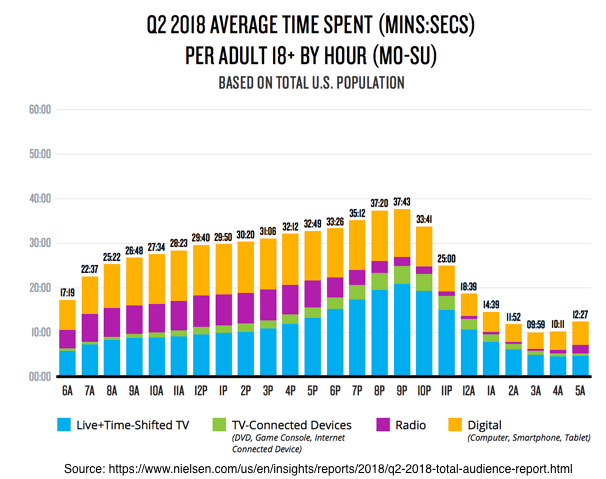 Unlike Nielsen, it provides a point-in-time snapshot. Activate Research 2019 and 2018. In original research, Activate used a variety of sources to estimate results for key data points that don’t exist. Further, reports vary in content and focus from year to year. 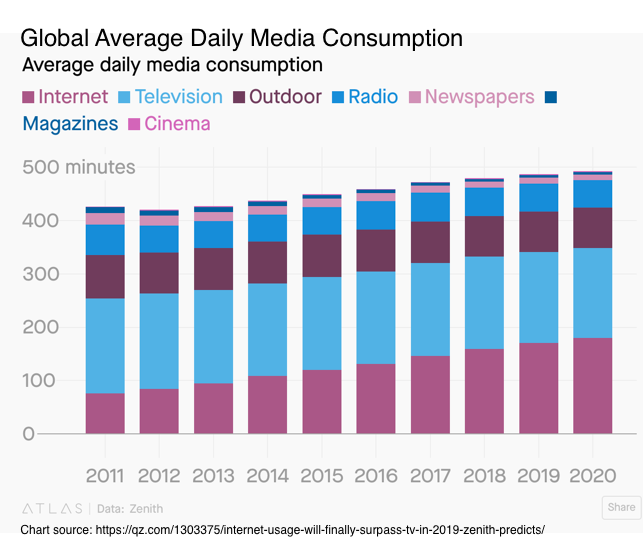 Zenith Media forecasts media usage globally to support advertising media buys. To understand your audience’s media consumption, let’s examine the major options. Broadcast television and radio consumption channels remain most used. Older segments prefer broadcast television while youngest segments prefer radio. Streamed video content use is almost double for youngest segments compared to the oldest segments. Streamed music including Pandora and Spotify remains a younger media behavior. So is downloading music. Younger segments are more likely to “rent” or stream content rather than own it. By contrast older age groups have experienced multiple music format changes during their lives. Podcast data reveals an age basis as well where young listeners consume media at a higher rate than older listeners. This results from usage issues like being aware of podcast content and knowing how to access and download it. Examine your content and media strategies based on audience intent and/or activity. Provide content when and where they need it. Consider age and media preferences when creating your content marketing. Provide the content your audience wants on the device they prefer. Audience media consumption has shifted by platform, device, content format and price. While media consumption varies by age segment, consumption changes can increase and falloff at the same time among age segments. Media consumption can falloff and increase at the same time among age segments! Video streaming both free and subscription dominate audience choices. 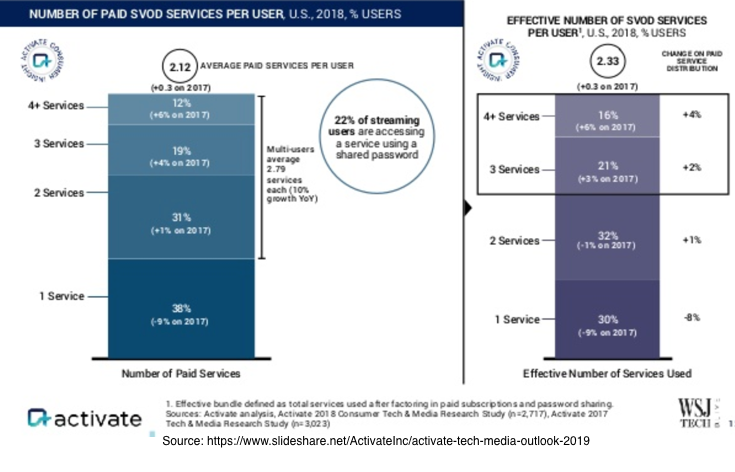 Further, Millennials and Gen Zers stream video at higher rates for both free and paid options. Social media consumption comes in second. Again, younger segments use social media more than older segments. This makes sense since social media allows people to keep up with family and friends. Music streaming ranks third. Again, younger segments use these services at higher rates. Digital text content attracts a quarter of consumers across age groups. By contrast, print publications fell off the most across age groups. 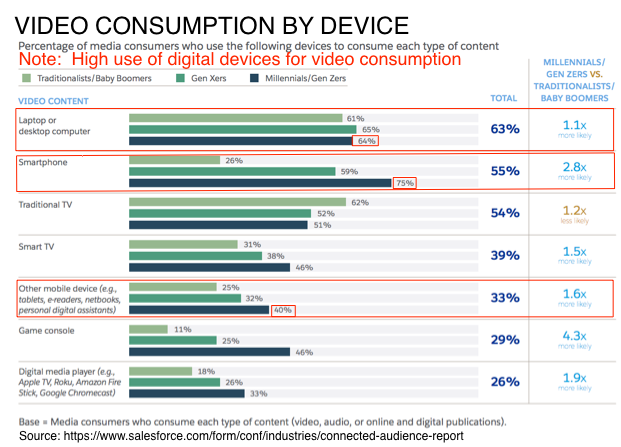 Digital content shows that consumers focus on the task, not the format or device. Focus on your sudience’s informatin needs first, then deliver content n the preferred format and device. Include social media in your marketing mix because it’s where your audience regardless of age spends their time. Provide quality niche content to compete with media entities. 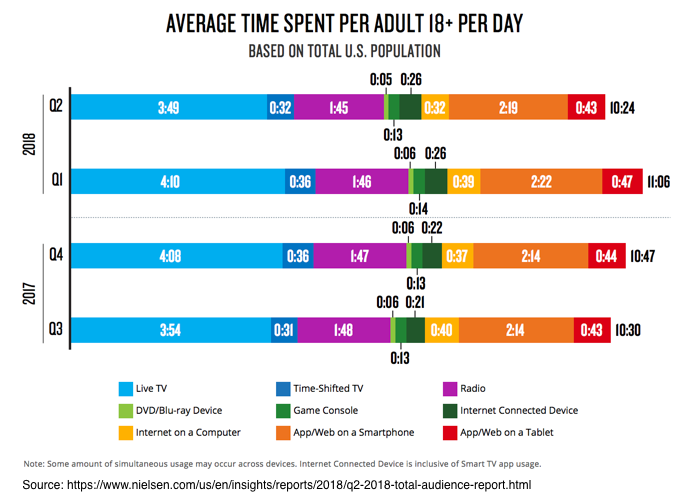 By contrast, due to differences in reporting and device usage, Nielsen shows higher media consumption for Americans. 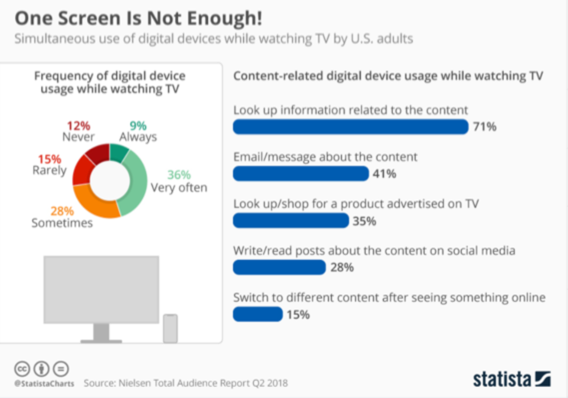 A deeper look at their data reveals higher reporting for television and other home devices and lower reporting for digital devices. 92% of US adults listen to radio during the week. Interestingly the oldest media device has the greatest penetration. 87% of US adults watch either live or time-shifted television despite the rise of television alternatives. 78% of US adults access an app or website via a smartphone. Since smartphones have outpaced other devices, think mobile-first for your marketing. 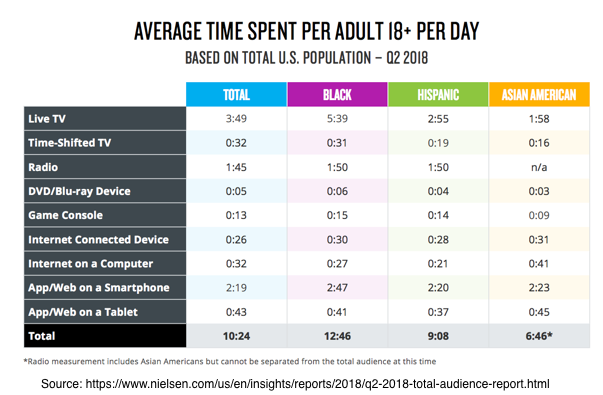 While Nielsen’s data provides a holistic view of American media consumption across dayparts, age, race and ethnicity, other data sources reveal important shifts in media consumption patterns. Note: Zenith data refers to Internet usage; eMarketer data refers to mobile. 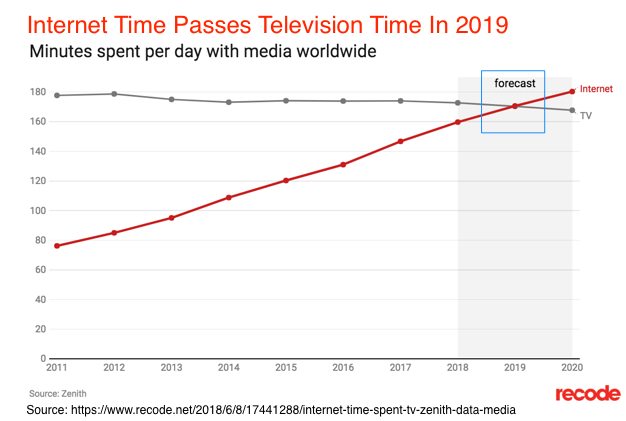 Television remains the dominant media consumption device including live TV and time-shifted TV. Further, television prime time still exists and peaks at 9:00 pm. 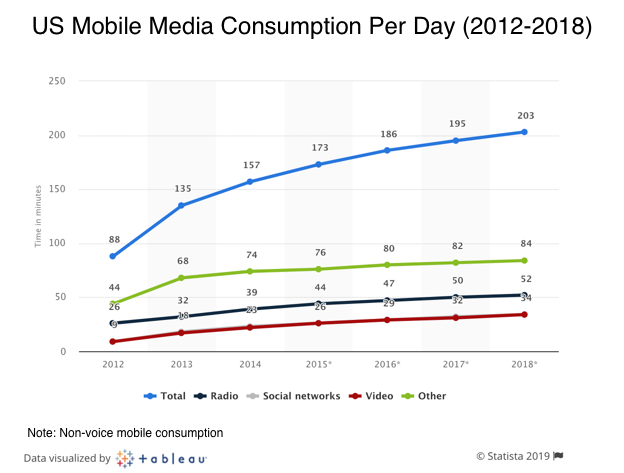 Radio consumption has remained consistent as a percentage of total media consumption. Even better, radio goes to work with consumption from 7:00 am until 5:00pm. Tablets usage remains consistent across age groups. Further, tablets have become a relax-and-consume content device that’s part of everyone’s life. Btw – Tablet usage peaked in 2016. Further, US media consumption varies by race and ethnicity. The movement of consumers towards digital media and video consumption underscores this trend. Further almost no one buys (12%) or rents (8%) DVDs. 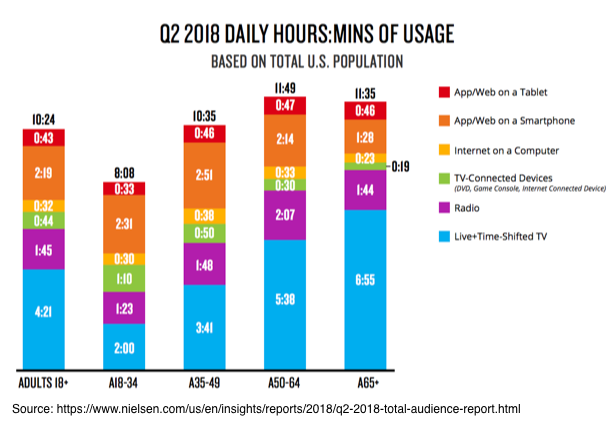 Notes: Nielsen reveals that the average US adult watches video for 5 hours 24 minutes but only 20 minutes occurs on digital devices. 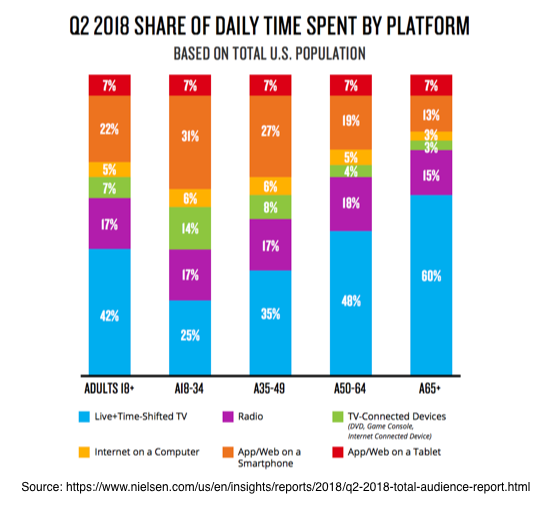 This seems low and may be attributable to Nielsen’s built-in television bias. Millennials and Gen Zers move seamlessly across digital devices when consuming video media. 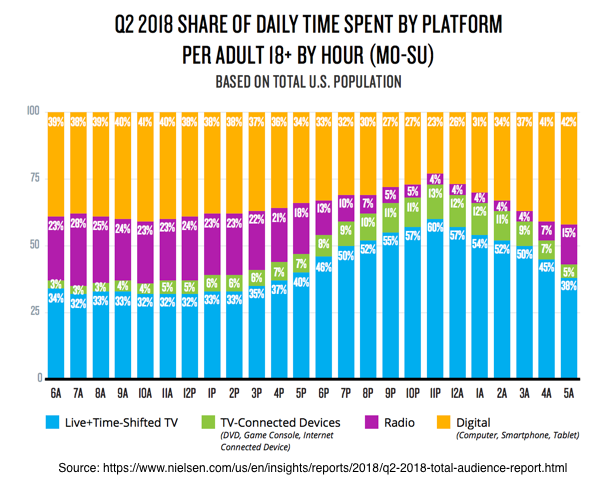 Roughly one quarter of them begin viewing a TV show or movie on one device and finish on another device at a different time. Audiences focus on task or goal, not the media platform or format. Additionally this younger video audience looks for short, snackable video content on free services such as YouTube. Offers wider variety of options. Can be consumed on device of preference. Is economical relative to other options. Create your content marketing to respond to your audience’s content objectives. Then transform into the formats they want and distributie it on their perferred platforms and devices. Go deep on niche content where appropriate. Changes in video media consumption have significantly altered media entities’ revenue streams. 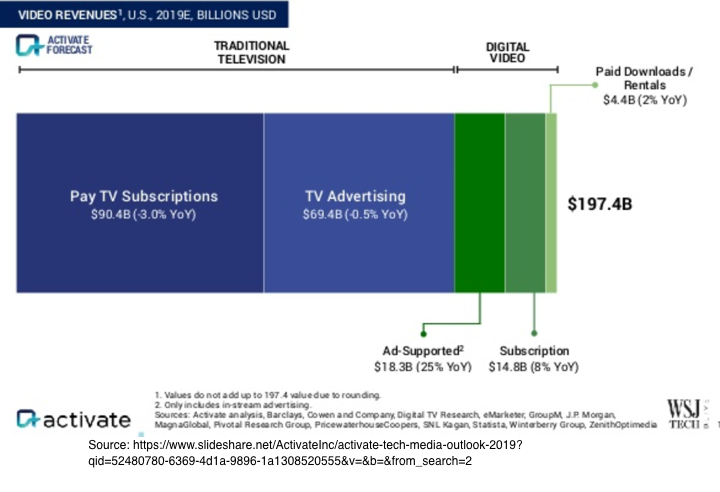 Interestingly, the lion’s share of video media revenues will come from subscriptions, not advertising! This shift reveals an underlying change in consumers’ willingness to pay for content. Diversify your revenue streams. Consumers will pay for subscriptions that provide quality experiences. 94% of SVOD subscribers have Netflix, Hulu and/or Amazon Prime. (Activate) Subscription services provide video binge consumption opportunities by automatically serving viewers the next episode. 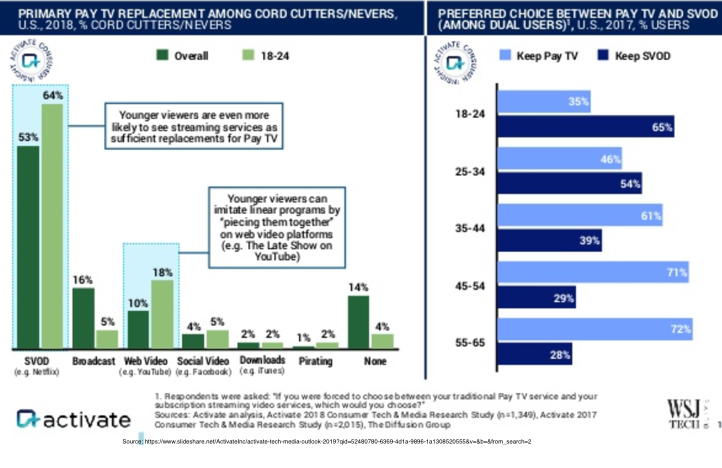 Younger adults, aged 18 to 24, tend to be cord-cutters since they prefer SVOD to paying for television. Additionally, this group willing goes through the hassle of piecing together content from the web This underscores the tradeoff of time for money. 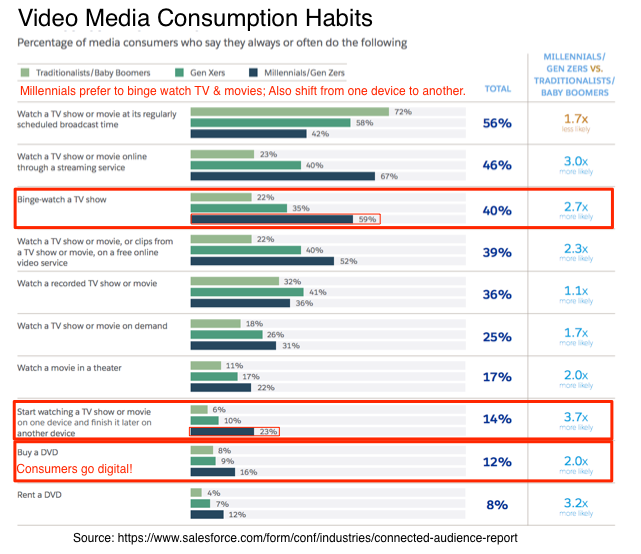 These SVOD content media consumption habits have changed your audience’s expectations for your content marketing! 76% of consumers want original content that has limited distribution. If you want your audience to pay for content, scarcity and need are key factors. 47% wanted content aligns with “my” interests. 28% wanted personalized content recommendations. But be careful with user information and don’t be creepy! Offer niche content where possible. Personalize your on-site visitor experience. 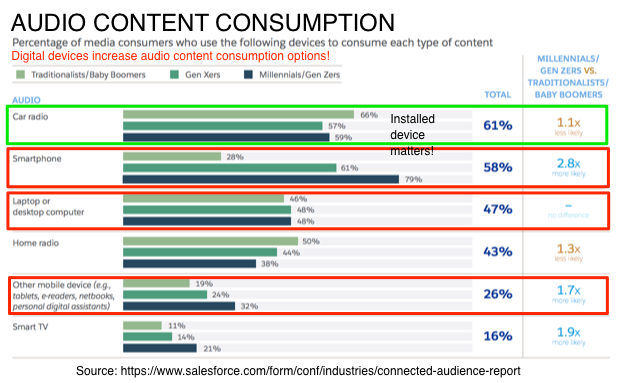 Audio content remains a core element of media consumption. Because we’re drawn to the sound of the human voice that we learned as babies. Beyond the spoken word used for news, sports and talk shows, we love listening to music, a consumption pattern that’s most pronounced among teenagers. 61% listen to audio via a car radio. 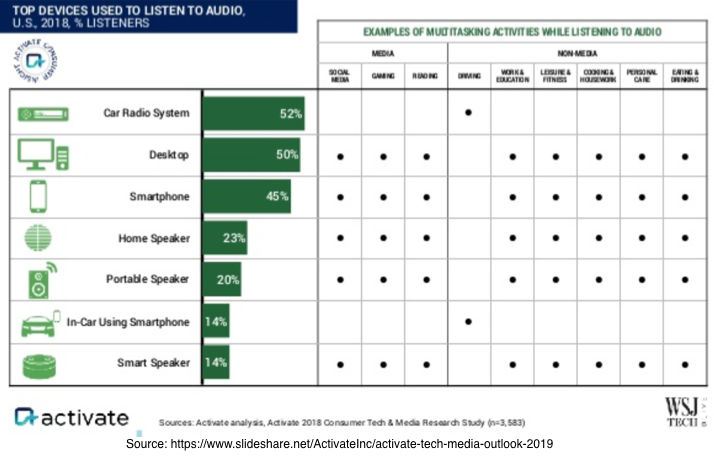 58% listen to audio via a smartphone. 47% listen to audio via a computer. 26% listen to audio via a tablet. While audio media options evolve and change with new formats and technologies, car radios provide a consistent listening environment especially for commute time. 90% of smart speaker owners listen to music. 68% of smart speaker owners listen to the news. 52% of smart speaker owners listen to sports updates. 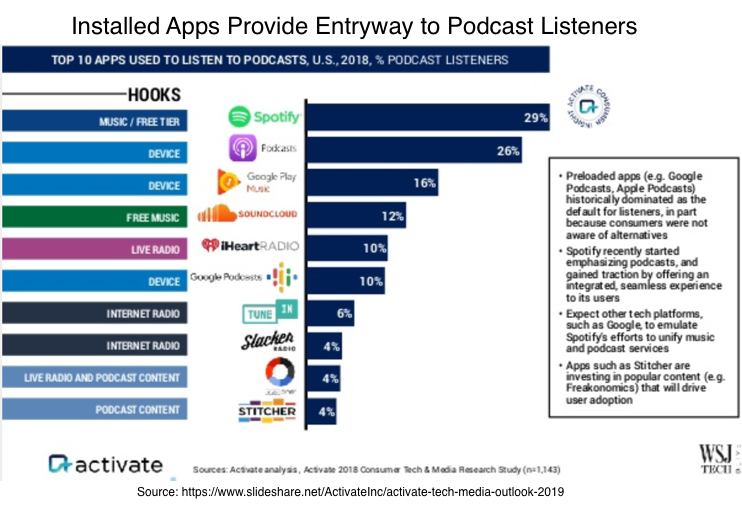 45% of smart speaker owners listen to podcasts and audiobooks. But digital options continue to gain traction. Unlike video and text media, audio content can be consumed while multitasking across a wide variety of activities beyond dual content consumption and consumption isn’t bound to a specific home or work location. For example with open plan offices and work in local coffee shops, workers consume audio media to block out noise and distractions. Need to increase listeners for your podcast? Use these top 10 apps to aid audio content discovery. Deliver your marketing message, communications and/or content when your audience can’t focus on text or video. Provide instructions explaining how to access and listen to your audio content since they may not understand how to use the technology, especially older age segments. Tap into the potential of smart speakers to make your content findable and/or consumable. Create an audio version of your content to reach a broader audience. Then distribute it via key audio engines. Smartphones remain the key game changer for digital media and content consumption. Because global consumers use their smartphones to access entertainment, news, information, research and social connections as well as to communicate. For marketers this translates to changing how you build awareness, communicate and engage your audience, nurture your potential buyers towards purchase and/or generate earned content. Note: Video and social media use overlap so that it’s difficult to see them separately. 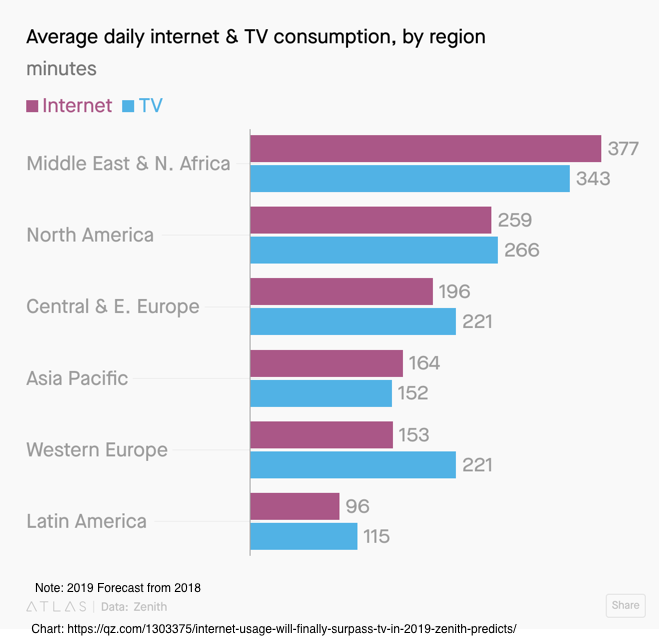 In an era of having connectivity everywhere, provide diverse content experiences and applications that your audience can access directly. To this end, focus on the mobile first consumer or risk losing them to your competition. But don’t be too hasty to overlook tablets! With consistent usage across age groups tablets have become a lean back and relax device. Instead take a more granular view to see how your audience uses different devices. 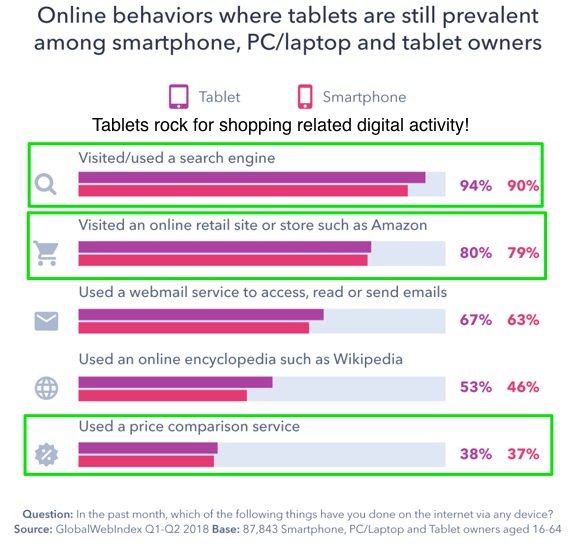 Because consumers turn to tablets for shopping related activities, even if tablets are used less overall! Make your digital content mobile first. Provide for tablet experiences, especially targeted at shoppers. Support tablet oriented digital content by focusing on platforms and apps that support this type of content discovery and consumption such as Pinterest and Flipboard. 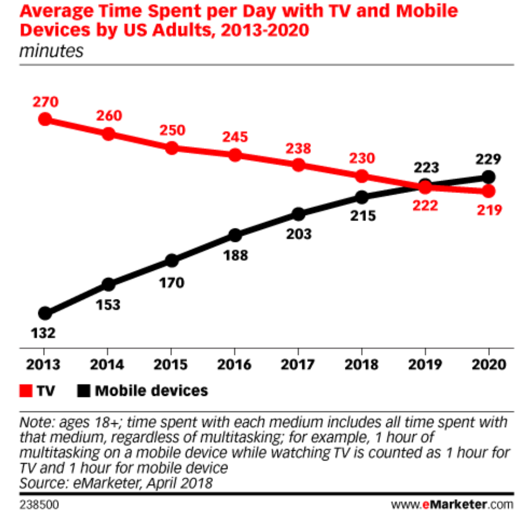 Consumers use television and video time to engage in multitasking, most often in the form of multi-screening. While the formats differ, this behavior isn’t new since television viewers have done it for years. 59% of viewers do something unrelated on digital media to the content they were consuming. 63% of people search for something related to the content they were consuming. Additionally, 45% of viewers email or message about the content (Nielsen). Dual media consumption frequently helps get potential buyers to find out more about your company and offering. 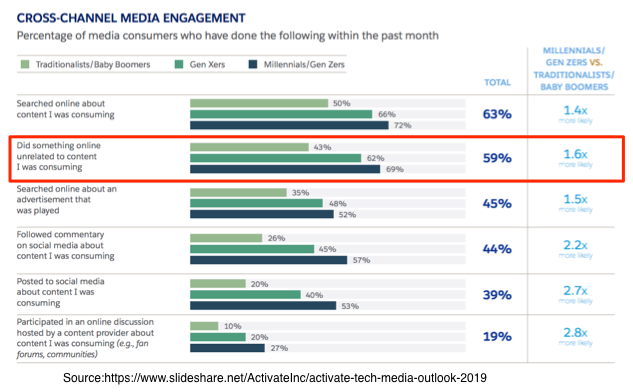 Further Millennials and Gen Zers are 2.7x more likely than older adults to use social media to engage about content they’ve consume in a given month. Optimize search aligned with your video and audio content. This also applies to your television and radio advertising. Tap into the power of concurrent viewer messaging. Encourage video viewers to share their experience. Also, let viewers communicate their findings with others involved in the purchase process. Offer chat messaging as part of the video viewing process to answer questions as they occur. Monitor social media for engagement and mentions related to your video and audio content. 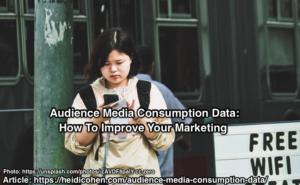 Audience media consumption has shifted. In large part this is attributable to increased use of digital devices and related media formats and options. As a result, your audience’s mindset matters more than the media device or format. 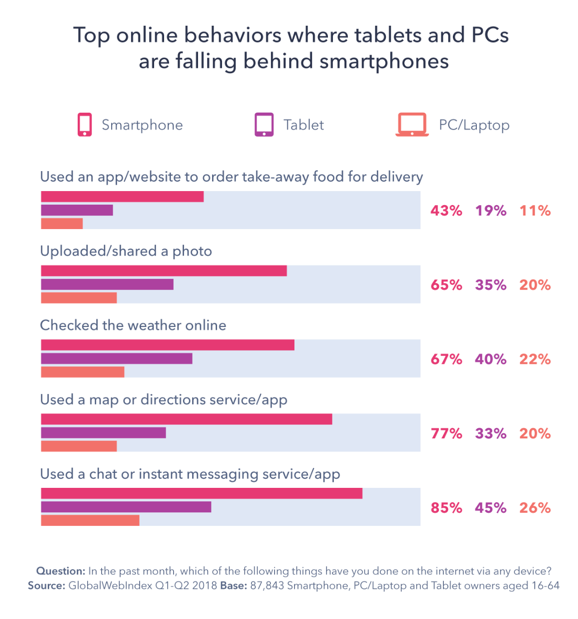 This trend is most obvious among younger age segments who move seamlessly from digital to offline devices. Focus on your audience’s needs or goals for seeking the information. Then make it findable across platforms and content formats on their time schedule, not yours! This means providing content, communications and information your target audience seeks in content formats that allow your customers to change platforms and devices seamlessly. Specifically adapt your marketing offering to conform to your audience’s current media consumption habits. To this end, view your content as fulfilling a specific need and then offer it to your audience in a variety of formats and platforms so they can choose how they want to consume it. Further with increasing mobile usage, make your marketing mobile first. Otherwise you risk being left out of the consideration set. 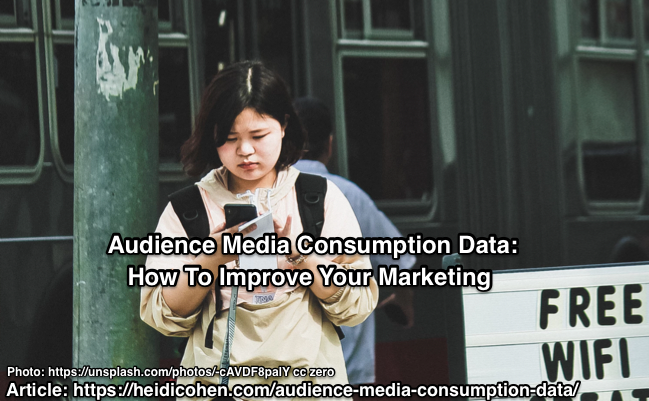 By adapting to your audience’s evolving media consumption habits you increase your marketing’s ability to break-through. Tags Activate Research, audio, eMarketer, GlobalWebIndex, Nielsen, Salesforce, smartphone, Statista, Tablet, Video, Zenith Media. Bookmark the permalink.